But I managed to solve all these difficult bits a pieces and it was really fun in the end. I had to buy a new pie plate first (later on I realised I didn't actually buy a pie plate but a tart plate) and I spent about an hour searching for a recipe. I discovered two recipes and decided to combine both as I wanted to make a plum pie. The original recipe I used for the dough is here. Well I finally collected all my strength to make the pie at about 9pm, not to mention I didn't have a plain flour and a corn starch. I'm so lucky a local shop is no more than 2 minutes walk away from our flat and is open till 11pm! Ok, everything else went really smoothly until the moment when the plum filling tried to escape from a pie plate and messed the whole oven. Think positive - I wanted to clean the oven anyway. Ugh, I love making pie. Today lesson - always make sure you are prepared! The dough may be done in a food processor but I don't have one so I used my hands. Whisk together flour, sugar and salt in a large bowl. Rub in butter with your fingertips until you get a coarse mixture. Add the water and blend until the dough almost comes together into a ball. You can add a little more water if it looks a little dry. Divide dough in half then shape each half into a ball. Wrap each in plastic wrap, and refrigerate them for at least 1 hour. Wash plums, cut them in half, removing the stones. Cut about half of the plums into quarters and half into sixths. Combine cut plums, sugar, salt, cornstarch and vanilla extract in a bowl and set aside. Lightly grease your pie plate. Roll out one ball of the dough on a lightly floured surface to make a bottom pie crust. Make sure there will be a bit of overhang around the edge of the pie plate. 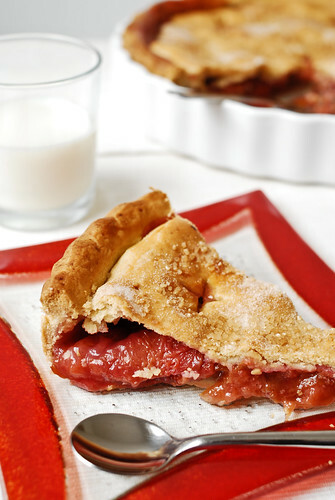 Fill the bottom crust with plum mixture. 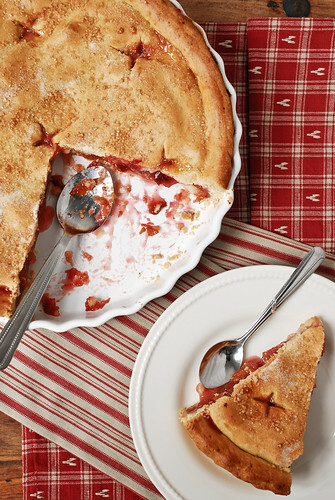 Make a top pie crust by rolling out second ball of dough and lay on top of the pie plate. Seal filling in completely by pressing down the top crust edges. Brush the top of the crust with egg wash and sprinkle generously with sugar. Using a small sharp knife, cut 5-7 slits in the top crust. Bake for 65-75 minutes, until crust is golden brown and the filling is bubbling through vents on the top of the pie. 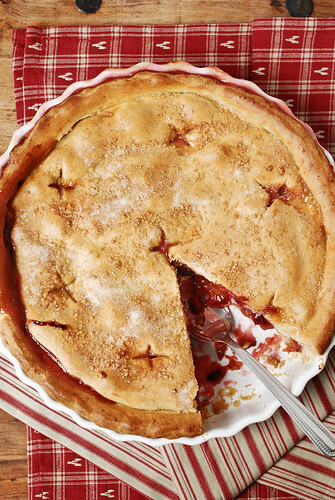 Let pie cool completely on a wire rack before slicing to ensure that the filling thickens up. All photographs and content on this blog © Copyright Sarka Babicka 2009-2017. All Rights Reserved.